The vision of the Physician Clinical Institute is the alignment and integration of the St. Joseph Clinical Institute physicians and St. Joseph Hospital to produce optimal patient outcomes across the inpatient and outpatient care spectrum consistent with the St. Joseph Hospital strategic goals of Perfect Care. The St. Joseph Hospital Clinical Institute is a professional organization of St. Joseph Hospital doctors who agree to practice the highest quality medicine using evidence based medical practice standards and to document those quality outcomes for inpatient and outpatient care. The Clinical Institute desires to serve the Medical Staff as an Evidence Based Resource for development of best practice guidelines including but not limited to clinical pathways, evidence based order sets and protocols. The process for research and development of these guidelines will be outlined in a separate document. We are committed to improving the human condition by understanding, preventing and treating disease, while continually improving the health and quality of life in the communities we serve. We are an organization that attracts and retains the finest physicians and health care providers to perform consistently to the highest ethical and professional standards. We are committed to practicing evidence-based medicine as a manifestation of this commitment to high professional standards. We treat all patients in accord with the Values of St. Joseph Hospital, which are Dignity, Service, Justice and Excellence. We respect the contribution of everyone in the patient care experience and are conducive to employee growth, support and satisfaction. 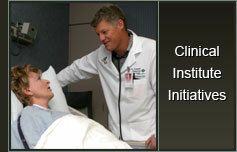 The Clinical Institute will be developed interdependently with the medical staff. The Advisory Board of the Clinical Institute will consist of Physician Leaders. Physician Leaders will include at least one member of the Medical Executive Committee, the CMO, the Medical Director of Clinical Quality, a representative of each of the four Clinical Institute Teams and two members-at-large. Clinical Institute Teams will be organized around five defined patient populations: Critical Care, Surgical, Inpatient (non-critical care) Outpatient, and Cancer Subcommittees. Work groups that are organized to study clinical problems that require input from multiple Clinical Institute Teams will be approved by the Advisory Board. 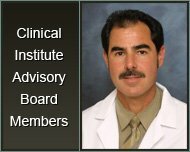 The Advisory Board of the Clinical Institute will appoint to each team at least three, or up to five, Clinical Institute members who demonstrate leadership and clinical expertise in the specific clinical area. Each Clinical Institute team requires a physician leader, accountable to the Clinical Institute Advisory Board. Teams are physician led and may include clinical resource experts from other disciplines such as Pharmacy, Lab, Radiology, Physical Therapy and Nursing. These resource experts may be called upon regularly or as needed by the teams. These members should be able to participate in working team meetings within existing job expectations.